Hopefully at this point you have read much of what this website has to offer. And when we see the world for what it is and all the evil that is encompassed all around us, it is easy to be discouraged and fearful as if Satan is winning and God is losing. But nothing could be further from the truth. Let me state emphatically that God is in complete control and he is sovereign over the whole earth and universe. Perhaps even Satan himself believes that he is winning. After all Satan has deceived the whole world and enslaved the whole world in and under his worldly kingdoms in which he rules at this time. But those of us that know the truth and authority of the scriptures and the multitude of reasons for which we can trust that the scriptures are true, we know, trust, and believe that God wins in the end. But you know what else? He is winning now, and he was never losing. Satan may be very intelligent far beyond our human capabilities, but God puts Satan's intelligence to shame with far surpassing intelligence. God allows Satan to do what he is doing in order to fulfill his own purposes. So Satan is being used by God in his futile attempt to win a battle that he never stood a chance at. God's ways are higher than our ways and his thoughts are higher than our thoughts, and that goes for Satan as well. God’s purpose in this life is to make ready those that will rule with him in his kingdom. This life is going to be one big history lesson for mankind that Satan’s way only leads to destruction. With these lessons firmly planted in our minds, along with our sorrows for falling short, we will finally give our allegiance to God with joy and stop our rebellion. We will be filled with his Spirit which will enable us to do this as our fleshly bodies are cut off. God’s mercy and grace will be on display in the end. Mankind has been rebellious and God’s wrath and anger will be triggered, but he will restore us because of his love for us. Only those that willfully reject his call will be cast into the lake of fire with Satan, the beast, and the false prophet. God gave mankind free will to do as he so chooses. God seeks a loving relationship with his children, for this is the reason he created us. But not a relationship that is by demand and force, but one that is mutual. God is showing us that his ways lead to life, peace, abundance, and happiness. But Satan's way leads to sorrow, pain, wickedness, and death. Our world is full of injustice, oppression, and greed. But thankfully, the gospel is the good news of the coming Kingdom of God to this earth to rule. By this time, perhaps we will finally be willing to submit to God and not reject him. We will see, but we will be without excuse. God will have provided every avenue and every effort to save us. It will be our free will choice. Everything Satan is doing today and throughout history is being allowed by God to fulfill these purposes. Satan thinks he can actually defeat God and replace God with himself. Satan has tried and failed over and over again to prevent God's plan from coming true. The sovereignty of God becomes apparent when we put all of Satan's failures into perspective. 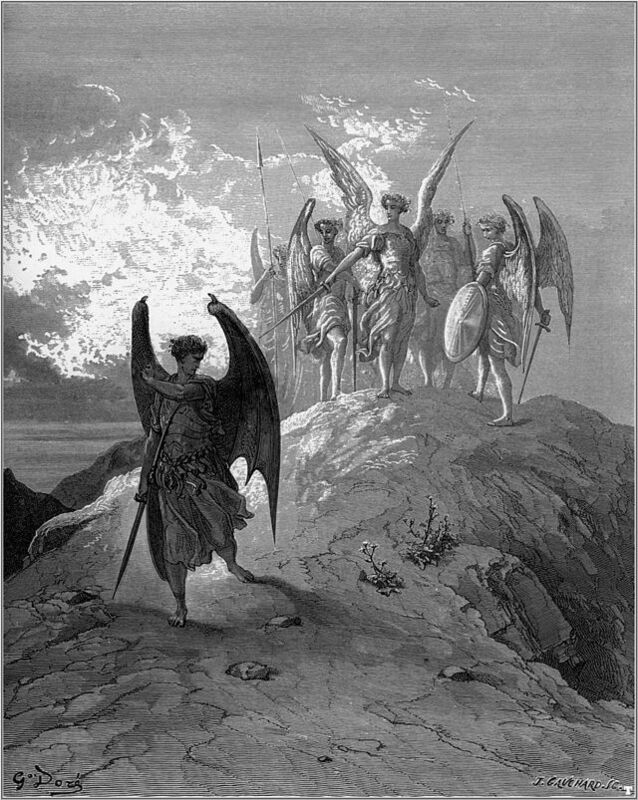 And we receive further assurance of Satan's future failure and defeat by retracing the ongoing battle between God and Satan that began long ago. Let's review this battle and see the sovereignty of God and the failures of Satan. We will see that God is winning now, he has been winning from the beginning, he was never losing, and of course we all know that he wins in the end as well. Also read my page The Synagogue Of Satan and you will see that Satan sought to create man in his image just as God was seeking to create man in his. Satan produced his own seed upon the earth through Cain. Now God must respond to this attack. War is declared on Satan. We are told that the head of the serpent would be crushed and complete victory for the seed of the woman would follow. War is declared and Satan now learns how he will be defeated. The seed of the woman is the Lord Jesus Christ Himself. This phrase "the seed of the woman" indicated unmistakably the fact that this coming Redeemer and this coming seed would have a human mother, but not a human father. The reference is to the virgin birth of the Lord Jesus Christ. Satan's only hope of victory lay in the prevention of this "seed of the woman" from being born, or to destroy it after it did come. If Satan could only interrupt the line of this coming promised seed, who is Christ, and prevent His coming, he would gain the victory without even a battle. So now Satan concentrates on the birth of the children in the line of the seed of this coming Redeemer. Leah's womb was opened by God and she bore Judah, through whom the promised Messiah would come. Rachel's womb was also later opened and she bore Joseph who would later receive the birthright blessings. God continues to destroy the objectives of Satan and Satan continues to fail over and over again. God preserves the people of Judah through Esther the Queen. The whole book of Esther is centered around this story of Haman's plot to destroy the tribe of Judah and how God worked behind the scenes and through a few select people to destroy this plan. The preservation of Judah keeps the promised seed alive and well through whom Satan would be destroyed. Antiochus Epiphanes, the king of Syria, during his reign dominated the Jews and forced them to abandon their culture and religion. He sought to destroy the Jewish people and their religion by burning scriptures and killing the Jews. Had he been successful, there would have been no Jewish culture for Jesus to be born into and there would have been no descendants from the line of David to be born from. The promise of the coming Messiah from the line of David would have been stopped. God raised up a small band of heros lead by a family known as the Maccabees. Against all odds, God caused their rebellion to be successful and the Jewish nation was preserved along with the temple. The temple was rededicated back to God and this event is celebrated today by the holiday of Hanukkah. Satan now must go to another strategy to defeat God. He rules over the Roman Empire and the Roman Emperors to persecute the saints and destroy God's people that way. Read The Roman Beast to learn more. He also caused the corruption of the Christian faith by combining it with paganism during the time of Emperor Constantine in the 4th century. God sent the Seal and Trumpet judgments on the Roman Empire and destroyed it. And the more God's people were persecuted, the more it grew. Read The Revelation Of The Seal, Trumpet, & Bowl Judgments to learn more. Satan then empowered the Popes of Rome to come to power and replace the Roman Emperors. Read The 1st Beast Out Of The Sea - Identified! to learn more. The popes through the Catholic Church persecuted the saints during their 1260 year rule from 538ad to 1798ad. This time was called the Dark Ages as the word of God was almost stomped out completely by persecution and burning of scriptures. God raised up his 2 witnesses and caused the Protestant Reformation. God caused the invention of the printing press which caused the word of God to be translated and distributed all over the world in many languages. God also sent the Bowl judgments upon the Roman Catholic Church causing it to loose power in 1798 bc. Satan again counters by the rise of the Jesuits. Read The 2nd Beast Out Of The Earth - Identified! to learn more. The Jesuits were originally established to counter the Protestant Reformation. They have successfully injected false prophecy teachings in the church deceiving God's people as the Jesuit General is the seat of the False Prophet. The Jesuits rule through the Catholic Church and the Pope and have successfully brought the whole world under their power. This is where we are at in the history of the world and the battle between God and his saints and Satan and his world empire. We have seen that God has continuously defeated Satan all throughout history. We know what the Bible says will be the end of Satan, the Antichrist, and False Prophet. Read Revelation 17,18,19 - The Final Destruction Of Babylon The Great to see how this will end. Praise God as he will win and the coming Kingdom of God will rule with Jesus as the King and the saints as kings and priests in his kingdom. Read The Coming Kingdom Of God to learn more. And read What Is The New Heavens, New Earth, And 1000 Year Reign? to learn more about what happens in the end as as result of all of God's victories and final victory.